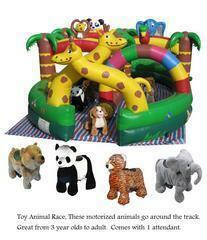 What a great party the Motorized Stuffed Animals go around the Jungle Race Track. Great for Company Competitions to the person that would rent a pony. MUST BE SET UP ON A SMOOTH SURFACE SUCH AS CONCRETE, ASPHALT, CARPET OR INSIDE, NO GRASS OR DIRT. NO RIDERS OVER 200 LBS. $50.00 for each additonal hour. THIS IS A 3 HOUR RENTAL AND RECOMMEND HIRING STAFF.